People are imperfect. We all make mistakes and the regret over those mistakes can build up inside of each of us. The pressure that slowly increases hurts our bodies, relationships, and our futures. Sometimes you just have to let the lid off. The effort each of us puts into any given task makes a tremendous difference in the outcome. My children don't get this just yet. It is possible that most children are the same. They focus on getting to the next fun thing, rather than on putting the best product forward before their release to fun freedom. My beautiful opportunity in homeschooling is to teach them to take pride in their work. The smallest of my offspring would much rather turn back handsprings than to write an essay on ANYTHING. She'd rather do math drills all night long than to create a coherent paragraph with her magic pencil. Today she had a great lesson in why effort matters. 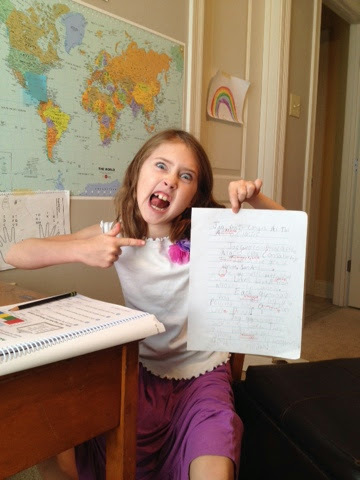 Writing is tough for kids who are still figuring out the appropriate way to express themselves. Communicating through words, rather than acting things out seems to be a real feat for this small girl. Too bad it is a required skill for life and this teacher doesn't back down on the writing requirements. If anything, they are increased at Dagobah Academy. When a "published" copy of her final work on a news article was turned in, my wee child and I had to have a little discussion about effort. Missing capitalization and punctuation, along with misspelled words and a severe lack of coherence in sentence structure would have surely produced a failing grade. Rather than allow this failing grade to happen, she was forced to rewrite. This was after the "fancy red pen" got busy correcting this writing train wreck. Tears started to flow as her lid came off. Calmly it was explained that in order to do anything in life, your best effort will get you the best result. We talked about whether a mediocre handstand would do, or if only the best handstand would get higher scores at an upcoming meet. As the steam was released from her container of regret, a lightbulb went on. She set to work on her final copy. Her handwriting improved. The new sentences were capitalized and her punctuation made sense. The words she used to describe her news article became more colorful and interesting. She even proclaimed as she was writing, "It feels better when I try harder." Eureka! Progress had been made and a continued appreciation for this opportunity warmed my heart. Letting the lid off can be good for each of us. Whatever type of pressure you allow to build up inside of you can be deflated. Let the steam out and allow yourself to put your best effort into whatever task is before you. Take away pressure's teeth! Living without regret and focusing on the changes that can be made right now will change your outlook completely.